People who travel through the North Central Region of New Mexico become spellbound by the towering southern Rocky Mountains and the ancient pueblos along the way. 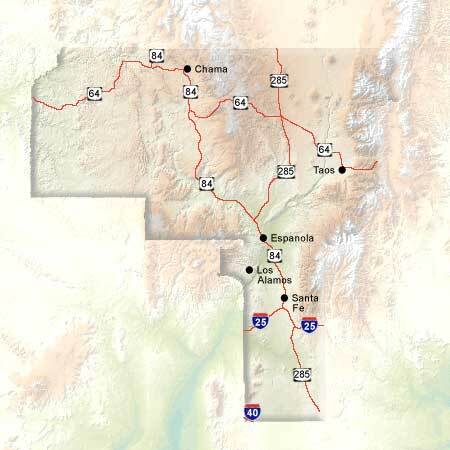 North of Santa Fe, the oldest capital in the U.S., is the Enchanted Circle tour, with awesome views of the Rockies and the suspended Rio Grande Gorge Bridge. Also in this region, some of the world's most famous pottery and jewelry can be found at Tesuque, Pojoaque, and Nambe pueblos. On the High Road to Taos from Santa Fe, one can stop in Chimayo and see the centuries-old Santuario de Chimayo, famous for its miraculous healing dirt and Good Friday pilgrimages. In Taos is the majestic, multi-storied Taos Pueblo, which is designated as a World Heritage Site. Farther north, the Cumbres & Toltec Scenic Railroad, a narrow-gauge train will appeal to history buffs.